Index call options are a simple, yet generally stable, way to trade options. Stock indexes are more inclined to trade in predictable trends and for this reason, can provide a good option trading strategy. 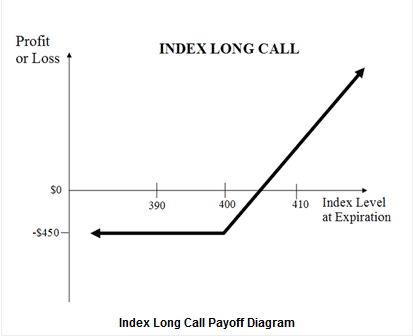 Assuming you believe the index will rise in the near future, you simply purchase an ATM long call option contract. The obvious benefit with going long these call options, is unlimited profit potential, since there is no theoretical price limit to which the underlying index may aspire before option expiration date. Unlike futures and spot forex positions, the risk on buying long calls is limited to the premium paid. You cannot go into margin call territory. Let's imagine we are trading a broad based index such as the S&P 500. These indexes represent a broad cross section of the entire market, which means their price action is much more predictable than for individual companies. Each of the above scenarios comes with it's own risk to reward ratio and probability of realizing a profit. The out-of-the-money (OTM) calls are naturally cheaper, but will only become profitable once they are sufficiently in-the-money to pay for the premium and then some. However, the longer time we allow before expiration, the greater the likelihood this will be achieved. So imagine the S&P 500 index is trading at 1800 and we wish to purchase ATM call options with 120 days to expiration. We would pay around $53.80 per option contract. If the S&P 500 rose to 1900 at expiration date, the options would be 100 points in the money. 1900 - 1800 - 53.80 = $46.20 profit per option contract. NOTE:- this is at expiration. If the underlying reached that point before expiration date, there would also be some "time value" in the premium, giving additional profit. In the money call options would be more expensive, but they would also have a greater options delta. This additional delta would provide greater protection should the price go against you, but in percentage terms, less return on risk when in the money. Because we are entering a simple position, going long index calls, the commissions will be cheap when compared to other strategies. They would be typically between $10 and $20 depending on your broker. Instead of thinking index calls, you may want to consider options on Exchange Traded Funds (ETFs) that are linked to indexes instead. Unlike indexes, they trade like normal companies, paying dividends etc. Many ETFs carry a portfolio of positions that enables their price action to mimic a given index. The options on these are much more liquid and about one-tenth the price of indexes. You get all the benefits of trading the index with less investment risk. Taking our case example above, the ETF equivalent of trading the S&P 500 index would be options on the SPY. The SPY would be trading around $180 when the S&P500 is at 1800.